Ok, ok I’m sure I know what you are thinking ‘euch sausage rolls’. Am I right? The reason why I know this is because before I tried these bad boys I initially thought the same. Please don’t be offended S. and M.. I guess I had just too many bad memories of the frozen and reheated mashed up pigs snout wrapped in soggy, stodgy ‘pastry’ type sausage rolls. These ones my dear reader are from an entirely different branch of the family tree. For example, if the ready made frozen ones are the Govan Ned these are the Highland laird; a much classier affair. 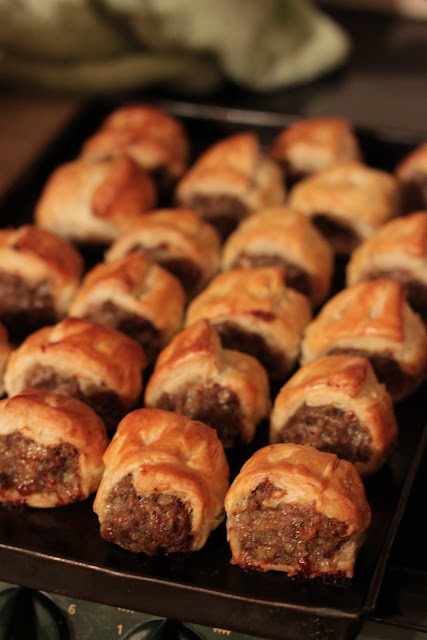 It really gets my goat when a blogger drones on about how great the dish is and how you really, really need to try it to believe it et cetra, et cetra so all I’m going to say is this; if you like haggis you will probably enjoy it and everyone that I’ve made these for has asked for the recipe. Always a good sign. Soften the onion in the oil in a frying pan over a moderate heat until translucent. Add in the torn sage leaves and cook through for another minute. Add the onion and sage to a large bowl along with the pork mince and haggis and one of the eggs and salt and pepper. Mix well. Roll out the pastry until it is about 1/2cm thick. Divide the mixture into 3 and make into long sausage shapes along the length of the pastry. Roll the pastry over the sausage mixture and press down the edges with a fork. Beat the remaining egg and brush this over the pastry. Cut the rolls into 3-4cm lengths and bake in the oven for 20-30 minutes until cooked through and the pastry is golden brown and flaky. I guess I’ve got bloggers’s block and it’s getting to be a real pain. When I’m not out and about with friends or pottering away in my kitchen I want to be spending my time on the right side of my brain; taking photos, trying new flavour combinations, starting to write... For those that follow thetwicebitten regularly you might have noticed that the number of posts have dropped from an enthusiastic 7 per month when I first started to a dismal 1 per month of late. At first I brushed it off as “just a bit busy at the moment” and tried to avoid acknowledging my difficulty. Quiet Sunday afternoons that I had pencilled in to write came and went with no fruits of my labour at the end of them. It just felt so forced and contrived. Anne Lammont in “Bird by Bird” beautifully captures hating what you write and it’s a book I’ve been coming back to time and time again. I’m going to plod on thanks to all the support from my lovely friends and I'm going to try to remember that the real prize is in the progress. In the meantime I’m going to keep filling my tummy with yummy things and fill my mind with the food writing greats. Here goes nothing. Melt the butter and 225g of the chocolate in a heatproof bowl over a saucepan of simmering water. Remove from the heat once smooth. Beat the eggs, sugar and vanilla extract with an electric whisk until well mixed. Pour in the chocolate mixture to the egg mixture and stir in with a wooden spoon. Sift in the flour, ½ tsp of salt and the baking powder in 3 additions into the chocolate eggy mixture and stir until mixed. Stir in the remaining 75g of chocolate. Arrange the mixture with 6 equal sized dollops of cookie mixture per baking tray. Be sure to leave enough space between them as they will spread during cooking. Sprinkle the pistachios and the sea salt to taste onto the top of the cookies. Bake for 10-15 minutes, checking after 10 minutes. They are ready when glossy and cracked on top, they will still be soft and gooey. Leave to cook a little before turning out to cool completely on a wire rack. I’m probably a little bit late in the game but it would feel wrong not to mark the New Year with a little post. New Year’s Eve was spent with close friends at A.’s grandpa’s cottage. It was lovely being back there after years of memories; from birthday parties as children to camping there as bolshy teenagers. The gamekeeper was there when we arrived, a real character and I don’t think I’ll ever get bored of hearing about the time he shared a mars bar with HRH “Wills” or the time he drank a 2 half pints of vodka not to loose face. People arrived in dribs and drabs, hugs were exchanged and glasses filled and emptied. Cheeses and other goodies were laid out, scoffed with more food miraculously appearing at any hint of a spare space in our bellies. Highlights include Nigella’s Christmas rocky roads and S. and M.’s amazing haggis sausage rolls (recipe to follow soon). We welcomed in the New Year with sweet Asti in glasses with little pheasants on them and sang and hummed our way through Auld Lang Syne. None of us had a clue as to the words to the second verse. As the night went on the party games got started and my competitive nature came out. We laughed and laughed. It was one of those nights where I felt just so happy to have the awesome friends that I have. are these not the cutest glasses ever? Seeing as it’s now January I guess we are all supposed to be very good and all on diets but personally I can’t think of anything worse than a calorie sanctioned soggy January. This is my toast to enjoying a little bit of the things you like to eat without the guilt. I’m not morbidly obese yet. I’ve called it midwinter’s tart as pretty much all I could see at the farmer's market was cavolo nero and onions, bring on the first of the spring veg. In the meantime i'll make do with a cheeky recipe title. Carefully remove the pastry from the packet and lay in your baking dish leaving a few cm overhanging the edges. Brush gently with the melted butter and continue to layer up the pasty until you have finished the packet. Mix the egg yolks with the crème fraiche, season and add this to the pastry. Mix the fried onions, cavolo nero, parmesan and anchovy together and add this to the tart. Brush the edges of the pasty with the melted butter and bake the tart for approx 20 minutes until golden brown. Grate the lemon zest over the tart and leave to stand for 5 minutes before serving.